As we hit week 5 of the college football season we will begin to separate the contenders from the pretenders. Every week from here on out, there are marquee match-ups that will have people tuning in all around the country. This weekend we have two massive games Saturday night, one of which I have a lot invested in. Week 5 should be a lot of fun so let’s get to the picks. We begin in the Big 12 with a pair of ranked teams as Will Grier’s Heisman campaign rolls into Lubbock, Texas, to face the Red Raiders. This game should be an absolute thriller with great quarterback play coming from Grier and Alan Bowman. Expect a ton of points especially from West Virginia with big play wide out’s like Marcus Simms and David Sills. The Red Raiders and head coach Kliff Kingsbury could use a marquee win at home but I don’t think they get it. I’ll go with Dana Holgorsen’s Mountaineers as they win it with Grier lighting it up and throwing the winning touchdown late. As we hit the fourth quarter last Saturday night at Autzen Stadium, the Oregon Ducks looked set to get their first major win in years. They had blown Stanford off the field for three quarters and the resounding sentiment around college football was that the Ducks were back. Then it all came crashing down as Oregon lost in OT. I think there will be some mental carry over for them this week as they face-off against a 3-0 Cal team. The Golden Bears aren’t particularly flashy but they play a very fundamentally sound game and are very physical. They already have a marquee win on their schedule as they knocked off BYU. I think they do enough to slow down Justin Herbert and win their Pac 12 opener making the Golden Bears 4-0. This is an intriguing game on the schedule as BYU comes in already having claimed one big time victory, as they knocked off Wisconsin two weeks ago at Camp Randall. Now they go into Husky Stadium looking to knockoff a Washington squad that just hasn’t looked comfortable all year. Jake Browning has struggled at times this year and Myles Gaskin hasn’t had the season we all expected. I think Tanner Mangum and the Cougars do enough to get their second road upset of the year and continue BYU’s climb of the rankings. Now we get into the big games as we pick the game that hosts College Gameday, with Penn State facing off with Ohio State. This game will be about two things. The first is the quarterback battle between Dwayne Haskins and Trace McSorley, two of the nation’s best signal callers. The second is the venue, as this game is at Penn State’s Beaver Stadium for another white out. The Buckeyes will really be put to the test this week without Nick Bosa in the lineup against a Penn State offense that features a lot of weapons. Haskins has yet to face a team of Penn State’s caliber or play a true road game, so seeing how the Buckeye’s number 7 reacts will be interesting. These are two great teams, and the winner will be in the driver seat to win the Big 10 and reach the playoff, but the home crowd will be too much. I like Penn State and McSorley to win this one as they conjure up the ghosts from two years ago. Ohio State Tyler Durbin’s 45-yard field goal gets blocked by Penn State’s Marcus Allen and Grant Haley returns it for a 60-yard touchdown in the fourth quarter. SUBSCRIBE to Big Ten Network on YouTube for the latest highlights and videos: http://www.btn.com/youtubesubscribe Looking for videos for your favorite Big Ten school? Uploaded by ND Football Plays on 2016-02-28. Hard to believe that was 6 years ago. What a game, what a rivalry, what a moment. That rain soaked goal line stand was one I will remember forever as a Notre Dame fan. Now the Notre Dame Fighting Irish and Stanford Cardinal meet as a pair of undefeated teams looking to take another step towards the college football playoff. Stanford is coming off of a wild comeback victory over Oregon in overtime so they are riding high. Meanwhile, Notre Dame is coming off their most dominant win of the year as they hammered Wake Forest with new starting quarterback taking the snaps under center. These two teams are extremely even and similar in many regards. They both play excellent defense and run the football well. Both quarterbacks have large receivers and tight ends that can make big plays for them. For all the similarities, something both sides have had years, Brian Kelly and the Irish have faired poorly against the Cardinal. Kelly has a record of 2-6 against Stanford as David Shaw’s group routinely gets the better of him. 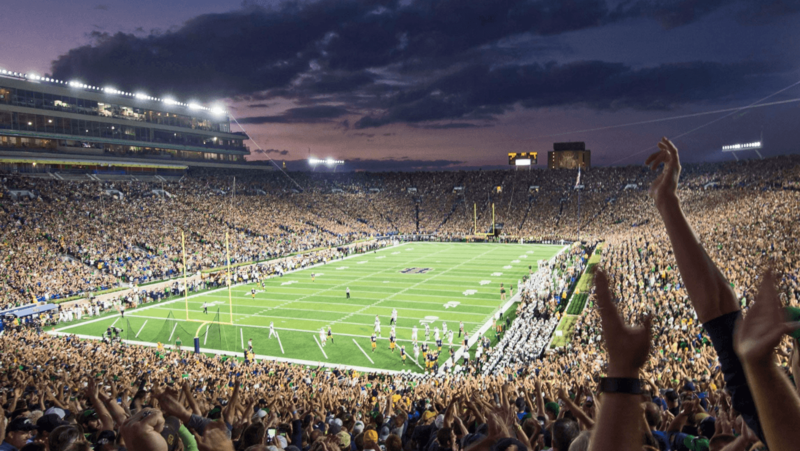 It’s time for Kelly and the Irish to answer the bell and beat Stanford and I think they will as the Irish win a close one at Notre Dame Stadium under the lights.